Finally, getting to post some notes from my recent visit to the Faulconer Gallery over in Grinnell! I visited the gallery firstly to see the exhibition “Left Behind” by Angela Strassheim (hurry because the show ends December 10, 2006). Of “Left Behind” I was immediately aware of tremendous photographic effort – theatrical -and very meticulous work by Strassheim. The prints were big and colorful and well presented – grouped in small “rooms” of around 4 photographs – each photo was so full of energy – it was almost tiring. Fish tank, while not the meatiest of the photographs, was one that sticks in my mind as a kind of “summary photo” of the whole show and effort – I liked the visual the analogy of the domestic interior and its depiction like being in a fish tank. The inversions are so powerful. The perfection of the home – interior – domestic bliss – clean, no dings in the wood trim – perfectly vacuumed carpets – all allude to no trace of personal existence -no dirt, nothing to hide -but almost too perfect to be real. 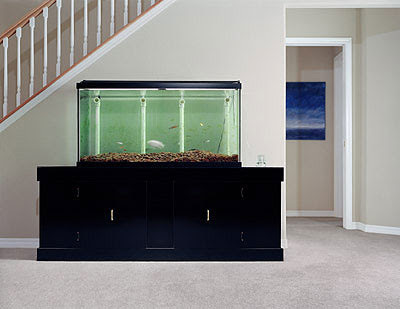 And the fish tank – just as bare with seemingly bored occupants swimming aimlessly with in the container of glass walls -however, their particular dirt is out there in the open for all to see – no hiding the dirty algae in the closet so to speak. I especially liked the hint of a painting in the distant hallway – alluding to a kind of “fish heaven” if you will – the great wide and free blue oceans… just out of sight of the fish occupants. Real or imagined – each image of this show “Left Behind” was completely loaded with this sort of depth. Well worth the visit. With this show, I was pleasantly surprised by the also showing (separately) “Portraits from Asia” by Marco van Duyvendijk – A very large showing of a number of different portraits… some of which are sure to be found in Mongolia: Photo Book. Another grouping from the series shown from the Betel Nut Beauties was interesting – from a cultural perspective. The van Duyvendijk exhibition was of an entirely different genera – not overly produced – the photographs are simply portraits. Very accessible – even to the way they are presented on aluminum panels unframed and just on the wall. What struck me was the differences between the “staged” and polished presentation of work by Strassheim and the found work of van Duyvendijk – more on this soon as it relates to the photograph as a “product” for consumption. Most importantly, seeing these two bodies of work got me to consider thinking about how one might view his or her own culture differently as an insider VS an outsider just visiting. Strassheim’s seemingly personal history – located in presumably familiar family settings VS. an outsiders view such as a northern European’s view of a Mongolian culture might produce completely different kinds of results from the experiences. I suspect there has to be different sensitivities which must influence the final work – different filters so to speak – but maybe an outsider – if tuned carefully can see the things closest to us with greater clarity – hard to say. This entry was posted in Other Artists, Photography and tagged Angela Strassheim, Betel Nut Beauties, Faulconer Gallery, Left Behind, Marco van Duyvendijk by Matt Niebuhr - West Branch Studio. Bookmark the permalink.